World class. It’s a description that any festival is delighted to obtain, and one that we’ve been so humbled to see attached to the Caribbean Food & Wine Festival as it has grown and blossomed over the past years. 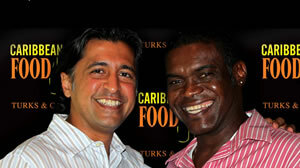 We are delighted to welcome you the 6th Annual Caribbean Food & Wine Festival this year, and hope you enjoy the many events and activities that are a part of what many now refer to as as “the culinary event of the year” in Turks & Caicos. Joining this year’s internationally recognized events are chefs Shawn McClain, a James Beard Award winning chef with restaurants in both Chicago and Las Vegas, Chef Elizabeth Blau, James Beard Award nominee and renowned restaurateur, Chef Kim Canteenwalla, culinary visionary behind award-winning Las Vegas restaurant Honey Salt, and Scott Brown of B&A. We’re certain that each meal will deliver a level of excellence befitting of each chef’s many lofty accomplishments. The culinary creations over the Festival will be paired with wines from Lail Vineyards, Wente Vineyards and Brewer Clifton Winery, as well as spirits from Appleton Estate Jamaica Rums. Each pairing has been crafted to highlight both food and drink, and elevate each combination to the sublime. local chefs for their continuous efforts and support in helping this event come to fruition. We also thank you, our guests, as your excitement, anticipation, feedback and support is an important ingredient to the success of the Festival. These combined contributions enable us to improve the experience for all those visiting our Beautiful by Nature islands. In addition, this support ensures we can assist with enhancing the culinary platform for our budding young chefs in the Lit’l Chefs Program, upon whom we hope that this weekend leaves a lasting impression. As we proceed with developing both The Caribbean Food & Wine Festival and our Turks & Caicos Islands culinary scene to new heights of renown, we are certainly excited to see (and taste!) the many fruits of these efforts. We wish you a memorable Festival filled with delicious memories, both this year and for many more to come.